It’s mid morning, Christmas Day, and we are already 2 hours up the Waimakariri River from our Klondye Corner starting point. We’ve been walking into the wind and just surprised 3 deer on the river flats and in only a few seconds they’ve assessed the situation, decided we are an immediate threat, selected their escape route and rapidly made an exit into a stand of trees approx 100 metres downstream. And that’s our excitement for the day as from here on it’s just more of the same, as we walk the river shingle all the way through to Carrington Hut. That’s not to say that we see this as a chore. The 3 Passes trip was the original reason for coming into the Arthur’s Pass National Park – it’s a walk that I’ve had my eye on for almost 15 years and now it’s coming to fruition at last. Carrington Hut is enormous – bunks for 30+ and floor space for as many again. But noisy – every gust of wind causes the large roof beams to move and squeak. There’s a number of interesting stories in the hut book about the original building of the hut, subsequent relocations and the characters that have made use of the hut over the years. These all make for light reading as we partake of a few celebratory Christmas drinks and prepare for the big day that is ahead of us tomorrow. By 8am on Boxing Day we are heading out the door to start the climb to Harman Pass, the first of 2 main passes that we’ll cross today. The Taipoiti River is a typical NZ alpine river – big rocks and even bigger boulders with a good flow of ice cold water. The track follows the stream bed and carves its way up the face towards the pass and as we draw near the there’s a significant series of waterfalls that cascade in on our left. We’ve been walking in mist most of the morning and our view comes and goes as the clouds swirl off the tops and around us as we continue the slow slog up and over Harman Pass. With the mist swirling around us, and visibility down to no more than 50m, Harman Pass is nothing more than a blur in my memory. I have a recollection of a trudge through rocky terrain with some huge boulders thrown in for good measure, one or two tarns to skirt around and more mist. The push higher up takes us to the first tongue of snow that develops into the snow field that leads higher up to Whitehorn Pass. The snow is soft, almost slushy, and cutting steps takes nothing more than a forceful “footstep”, at times the step disintegrates and there’s more backward slide than forward progress but eventually we complete the 2-300 metres of vertical climb that brings us to Whitehorn Pass. The route guide describes the next step as “locate the large rock cairn on the left side of the pass and carefully descend from down the scree slopes into the Cronin Valley”. Key to this is finding the large cairn, and so after 15-20 minutes of fruitless searching in the mist we give up and set our own path for descent. Once we navigate some bluffs it’s not like it’s a big issue, because there’s only one real option – downward over the scree to the Cronin Stream that’s expanding in flow from the huge number of snow melt streams that are dropping in off the Rosamond Ridge. We take a break for a bite to eat an hour or two down the valley before continuing the march toward Park Morpeth Hut. This is “big country – high alpine ranges with deep valleys and strong flowing streams and rivers. There are signs of some “traffic” though the valley. We come across a cairned route for the later stage of the descent and the occasional footprint and walking pole mark suggests we may have company in the hut tonight. By mid afternoon we are completing the last river crossing, climbing the last scree slope and making the final descent to Park Morpeth Hut. Tomorrow has been declared a rest day! A rest day it is, the rain has arrived just in time and there’s no motivation to push on to Harman Hut today. Park Morpeth Hut is one of the Canterbury Mountaineering club huts and true to form it is stocked with a “library” of CMC annual magazines that become the entertainment for the day. At one point I take a break, pull on some wet weather gear and head out to take photographs but generally it’s a low action day. The following day though we are primed for the climb up Browning Pass and the descent down the valley to Harman Hut. When you first look at the route to Harman Pass on the map you feel the feel the cartographer’s made an error – the contour lines appear to be all stacked on top of each other. By the time we pull ourselves up over the last 10 metres onto Harman Pass we realise that it’s us who have made the error – the contour lines are just as they should be! Bizarre as it sounds, in gold rush days Browning Pass was considered an option for a route from the east to west coast of NZ. The gold mines on the west coast were pulling the miners and shop keepers out of Canterbury, all they needed was a viable route for them and their horse and cart combinations to negotiate. The zig-zag track we take up to Browning Pass initially follows some of this old route – how they ever intended to get horse and cart up there is beyond me! Once on the pass the view is amazing. To the south west the Wilberforce River snakes back beyond our start point at Park Morpeth Hut. To the west there’s still snow pockets on the Marshal Ridge and the other surrounding peaks. To the north we have Browning Lake, Mt Harman and from our lunch spot we can see our next obstacle to negotiate to make Harman Hut for the night. A steep descent ensues, through the alpine grass terrain before finally dropping into the valley and following the un-named river, complete with numerous crossings, as we head downstream to the hut. The final leg of today’s journey has us following the “West Coast teams” contribution to West – East miners’ route. Although overgrown with scrub it’s easy to see that this team also made a significant contribution. We overnight at Harman Hut along with 9 others walking the 3 Passes route, before making an early start on the final push out to the road end. Our final day is all about true NZ West Coast terrain – mud, slush and BOG! The track is well defined and just when you think you are making good progress you can step forward onto solid ground only to find that solid it’s not, and you are up to your knee in soft peat bog. Eventually we leave that behind and are on the banks of the Styx river and making good time. The lush native bush is fantastic to walk through, it’s something I never tire of and it’s topped off by my first ever sighting of the native NZ Blue Duck. And not 1, but a family of 9! That warrants a long stop for us to watch as they negotiate a crossing of the swiftly flowing river to put some distance between us. The Department of Conservation and ?? have a joint programme in place to reduce the number of predators and hopefully grow the Blue Duck population. If our sighting is any indication, this programme appears to be working. By 3pm we are lifting packs off our back for the last time and congratulating ourselves for completing the 3 Passes trek across the Southern Alps. It’s been a brilliant trip – the weather was good when it needed to be and poor when we wanted a hut day. The terrain tested us and proved we are on track for Mt Denali in May, and most of all it was just a fantastic trip with friends in the NZ outdoors. Now for a cold beer in a West Coast pub!! New Zealand back country huts are unique and open for everyone. All you have to do is make the effort to get to them! You can’t beat them for location, they are always a welcome sight when you get to them and they all provide a useful stepping stone for tomorrow’s next adventure. They have various origins – from the early mountaineering clubs of the 1900’s, the government-backed deer culling operations of the 1950’s, the NZ Forest Service that transitioned to NZ Forest Corporation, various local tramping clubs and nowadays owned by the Department of Conservation. Design, materials, size – there are many flavours of hut but it’s always interesting to see what each hut contains for the reading pleasure of the next occupant. While in Arthur’s Pass over Christmas I had two different experiences.- I spent a rest day in Park Morpeth Hut, one of the huts on the 3 Passes route. Being a hut owned and maintained by the Canterbury Mountaineering Club I guess I should not have been surprised to find a fairly comprehensive set of the CMC’s annual magazine. Lying back reading through these magazines was an interesting re-introduction to well-known NZ mountaineers. It was an easy and enjoyable way to take a rain enforced rest day. Worsley biv provided another interesting find. 2 copies of the National Geographic. In itself not surprising – but the dates of the magazines and their almost perfect condition was! 1965 and 1974 – some interesting stories, but most entertaining were the advertisements, especially from the earlier edition. Advertisements for Eastman Kodak and Hasalblad cameras, Seiko wrist watches, ride on lawn movers, overseas holidays and colour televisions (the size of a small fridge) all signs of success for the then “modern” US family. And several pages of classified ad’s enticing parents to enrol their son’s for next years intake to military school. Not quite the same perspective as the CMC annual magazine but possibly a more interesting snapshot on social and life changes over the past 50-60 years. I couldn’t help myself and took photos of many of the advertisements. Take a look through the photo gallery and enjoy the trip back to the 1960’s…..
NZ Kea, where have they gone? I set out with some pretty high expectations. After all I was going to the “home” of the New Zealand kea – Arthur’s Pass National Park. If you were looking for kea this is the place to be. So as the 3 of us set out from Andres shelter in the Poulter valley for 6 days of walking in the valleys and high on the alpine ridges I was expecting to come back with a memory chip chocker block of photos and video to share with you. for talking to the kea. And so it turned out to be – just as we started dropping down the ridge to the old Casey hut site – there they were, 2 kea on the track in front of us, and apparently with no intention of stepping aside. For 10-15 minutes we watched, “chatted” with, and photographed the kea as they entertained us with their quirky inquisitive mannerisms. Eventually they grew tired of us and flew off into the tree tops nearby and left us to make our way on down the ridge. I expected this scene would be repeated many more times over the next 15 days , but no!! The closest we got to a repeat experience was the kea in Arthur’s Pass village that entertains the travellers. For the rest of our time in their “home” we heard a few on the far off bluffs, calling across the valleys, we saw several at distance, as they flew through the valleys but it was occasional at best and nothing to compare with our initial contact. Is our experience now the norm? When we discussed the number of sightings that we had made over the first week with the Arthur’s Pass Department of Conservation (DOC) they were excited with how many we had seen. And that’s the sad situation that the NZ kea is now in. Numbers are dwindling – not to the point that they are about to follow the moa into extinction. They aren’t in the “critically endangered list like the Kakapo but they need some outside assistance, like that provided by the Kea Conservation Trust to ensure they don’t go that way in the next few years. Here’s some other photos from our brief kea encounter. Arthur’s Pass New Zealand, an inspiring place to go walking !! Hugh, Bridie and I had 15 days there over the Christmas break to “head for the hills”, assess where our fitness levels were at as Hugh and I prepare for Mt McKinley in May 2017, but importantly just an opportunity to get away from the city and enjoy ourselves. We initially set ourselves some reasonably ambitious targets and as has so often been the case when we return to NZ to go walking, the weather made all of the plans irrelevant. We arrived in Arthur’s Pass village on Sunday morning and made ourselves known to the Department of Conservation (DOC) team to find out that all rivers to the northern end of the park were at “extreme flood” levels and were impossible to cross. A hasty review of the map, a confirmation from Chris, our friendly DOC advisor and we had reorganised ourselves to start at the southern end of the park (Andrews Shelter) and make our way north up the Poulter Valley, climb up ?? to Lake Minchin, turn south and return via the Edwards valley after climbing over Trudge Col.
As it went the plan had merit and looked “do’able. By day 3 we’d walked up the Poulter valley, spent a night in Poulter Hut and completed the slow climb up the Minchin ?? to Minchin biv. where we took an another overnight before heading back down the valley to Worlsey biv. The walking in Arthur’s Pass National Park is fantastic. The Poulter valley is wide and open with big mountain ranges all around. The winding open river makes sure you get your feet wet as numerous side stream and river crossings keep coming at you, and Lake Minchin. Well it’s just a surprise that awaits you as you come over the ridge and first see it through the beech trees. An amazing blue colour, a reasonable chop on the surface from the wind that’s coming down the valley and a vista that stretches up the valley beyond. It was hard to break ourselves away from the stop we made at the head of the lake to continue on to Minchin biv. The biv sits up toward the head of the valley about an hours walk from the pass and to access it you need to “boulder hop” and “bush bash” your way there with the stream as a guide. You can see the “Forest Service Orange” painted roof of the biv from the bluffs lower down the valley and you just have to trust yourself that you will eventually come across it as you make your way up stream. By the end of day four we were back in Worsley biv and suspecting that more bad weather was on the way. The clouds were “close in” and very grey with the wind starting to build. By morning it was raining and a call to DOC for a weather update confirmed the second severe weather warning of our trip. This time, along with the rain, there was snow expected down to 1400 metres. By late afternoon of day 5 we were back in Arthur’s Pass village, installed at the “Wobbly Kea” enjoying a cold beer and a hot pizza refining our plans for phase 2 of the trip – the 3 Passes walk through to Hokitika. Heres a gallery of photo’s from this trip in the Poulter Valley. 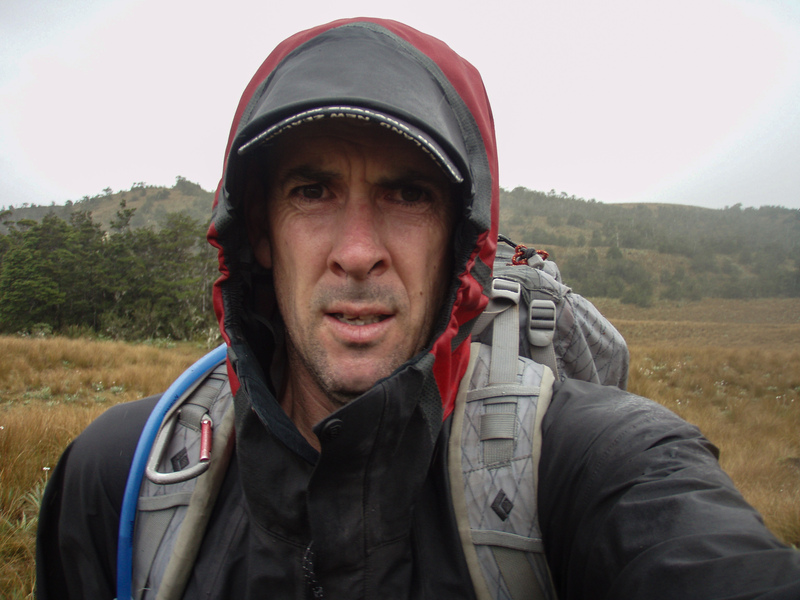 Please “LIKE” my blog page as there’s more stories coming from the trip to New Zealand – thank you. I Need to Vary My Training Programme! There’s only so many weights sessions, aerobic’s classes and spin bike rides I can do before the monotony starts to set in. And with 5 more months before we leave for Mt Denali I cannot afford to reduce my training effort. It’s a competition and I’m sure I’m coming second. So how do I solve that problem? – easy. Head for the hills. – BIG hills and with a heavy back pack. Fast forward 2 weeks from today and I’ll be in Arthurs Pass area of the NZ Southern Alps with Hugh and Bridie, eying up some awesome scenery as we set out for 15 days trekking around the Polar Range area and then finishing with 5 days walk through the 3 Passes to Hokitika. And thanks to Lindsay at Kathmandu we’ve found ourselves small players in a large project – one to raise awareness about the Kea, NZ’s native and the world’s only mountain parrot. Like this blog and stay in touch with this new min adventure project as it unfolds over the next few weeks..
NZ Kea – to inquisitive for their own good. The final report from our expedition to Heard Island has been delivered to the Australian Antarctic Division . I only played a small “bit part” in the overall Heard Island Expedition 2016 but for all that, it consumed an enormous amount of my time in the 12 months before we departed Cape Town. And then for 6 weeks it was all I knew. Thanks to the team at Kathmandu for this reminder of Heard Island 2016. This was an awesome adventure, and definitely one that I would repeat again if the opportunity ever presented itself. And now it’s on to the next big adventure – Mt Denali, Alaska – May 2017.